Matt Bell is the author of Cataclysm Baby and How They Were Found as well as three chapbooks. His fiction has appeared in Conjunctions, Gulf Coast, Willow Springs, Unsaid, and American Short Fiction and has been selected for inclusion in anthologies such as Best American Mystery Stories and Best American Fantasy. He teaches creative writing at Northern Michigan University, and previously taught at the University of Michigan. He is the senior editor at Dzanc Books, where he also runs the literary magazine The Collagist. Monkeybicycle: Your writing career seems a perfect gradient: You opened with a story collection (How They Were Found, 2010), then released a novella (Cataclysm Baby, 2012), and now a novel In the House Upon the Dirt Between the Lake and the Woods. Was this gradual rise luck of the draw or meticulous planning? And now, unless you plan on writing a children’s book, YA novel, play, or non-fiction collection, is it novels from here on out? Matt Bell: It does have a sort of progressive look to it, but I was writing a lot of these books concurrently, and there are plenty of failed projects interspersed in there too. I wrote Cataclysm Baby while I was editing and publishing the stories in How They Were Found, and I started In the House the same year How They Were Found came out. In between there was another novel or two that didn’t come together, and so on. As for my future plans, I’m working on another novel right, as well as some new stories. So at least for now, all those other genres are safe from my attempts. Mb: Prior to the official release of In the House Upon the Dirt Between the Lake and the Woods, Soho Press did an enormous galley run and landed a slew of publicity, including the cover of Publishers Weekly. How important is this kind of up-front, anticipatory publicity for a book such as In the House Upon the Dirt Between the Lake and the Woods? MB: Because I imagine myself as a person who’s always playing catch up, I sometimes assume that other people already know about all the books I’m excited about—but of course I’m probably actually playing closer attention to what’s coming out than other people, from years of working as a reviewer and in publishing and so on. As you know from MLP, it takes an almost unreasonable amount of effort to make people anticipate new books and new writers, and even then there are no sure things. In answer to your question, all I can say more sure is that I’m lucky to have a publisher who is willing and able to do so much on behalf of the book, and I only wish that more of my favorite books had such great champions behind them. Mb: Like Cataclysm Baby, In the House Upon the Dirt Between the Lake and the Woods deals with anguished childbirth and disfigured and malformed children. Where does this vein in your writing come from, and do you believe In the House Upon the Dirt Between the Lake and the Woods has exhausted this aspect for you, or will it always be a focal point in your work? MB: You know, I really don’t think of either book as dealing with these topics, as you’ve framed them, even though those elements certainly exist in the book. To me, they’re not about reveling in what goes wrong for parents, but about the better hopes they have for themselves and for their children and their futures. And yes, those hopes frequently are thwarted, sometimes horrifically, but my own hope for those parents and their children is that they somehow put aside what they thought they wanted and instead learn to embrace what they have. Some of the parents in Cataclysm Baby manage this, and some don’t. The husband in In the House is an incredibly stubborn egomaniac, and much of what goes wrong in his world is caused by his refusal to accept the terms of his family as well as his attempts to force the world to bend to his first wishes. I probably won’t write about these subjects in the same way anytime soon, but I expect there will always be a tension in my work between the life my characters believe they’re meant to lead, and the life they find instead, earn or are given. That’s something we all have to contend with, in our own ways, and I can’t imagine a character who isn’t, in some way, affected by similar concerns. Mb: In the House Upon the Dirt Between the Lake and the Woods also features animals in both their natural and imagined states, often mutated or evolved into new forms or possessing hyper-human qualities. Animals, both real and invented, seem to be a motif of some contemporary literature. Where do you think this comes from, and how does the “animalistic” function for you as a writer? MB: I’m not really sure where it comes from in my work, exactly: There isn’t a theoretical idea behind it, nothing predating the work that I can offer. I will say that it seems to me that animals as they appear in my work seem to be creatures of myth from the start: There are no pets in my novel, no beasts of burden. The only animals the characters meet are trapped or fished, or else struggled with as adversaries. They are part of the dangerous world around them: The husband and wife move to this pastoral location, but they do not live as people do in those kind of tales. They are as estranged from the world around them as they eventually are from each other, and that’s just as much a part of their tragic circumstances. Mb: American Book Review said “Matt Bell joins the company of great fabulists like Franz Kafka, Jorge Luis Borges, and Italo Calvino.” What do you think of this label? Is it who you are as a writer? Does it apply to In the House Upon the Dirt Between the Lake and the Woods as well as your previous books, or only to some of them in particular? MB: It’s obviously an incredibly kind label, and I won’t say anything against it here, because I assume that the reviewer wouldn’t have written if he didn’t mean it. More than anything, it’s a humbling thing to have had said about my work: a comparison that I would never claim for myself, that I can only hope to one day somehow truly earn. I won’t pretend to be there yet, but I’ll admit that I wouldn’t be working as hard as I am every day if I didn’t hope one day to at least get close to that sort of accomplishment. But I imagine that’s many years from now, if ever, and it’ll take many more books too—and even then there are no guarantees, only hope. 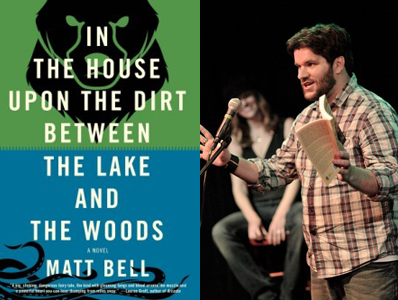 Purchase a copy of In the House Upon the Dirt Between the Lake and the Woods here, & read more from / about Matt Bell here. J. A. Tyler’s latest novel Colony Collapse is now available from Lazy Fascist Press.